With over thirty years of operations and experience, BMI has built a solid reputation as one of California’s most trusted businesses. Building Maintenance Innovations, Inc. is committed to providing quality services at competitive pricing. The team at BMI believes that a reputation as an honest and reliable business is the recipe for success. While others seek to profit by making false claims, cutting corners, or recommending unnecessary services to customers, the BMI team believes that a good reputation and consistent service will reap bigger profits in the long run. By being trustworthy, the team at BMI believes that they will enjoy a long-term, profitable business serving your needs. Forward thinking, ingenuity, and knowledge set BMI apart of the rest. The team at BMI is proud of the relationships they have forged with their fellow employees, vendors and within the commercial and industrial property owners and managers. When you work with BMI, you know you are working with a company that has the experience to understand your needs and business goals. I have worked closely with Mike and Brenda Mayo for over 15 years. They are honest and have employees with know how to get the job done right the first time. BMI has always come through for me and my tenants. 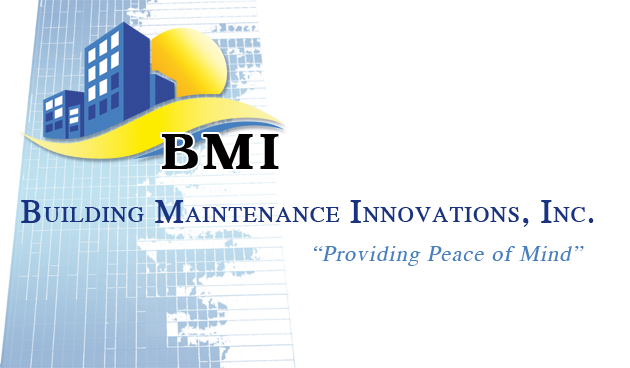 I recommend you contact BMI to see what cost effective, great service is all about. For over 20 years, I have relied on Mike and Brenda Mayo to provide me with the necessary services to keep my Industrial Business Park running smoothly.